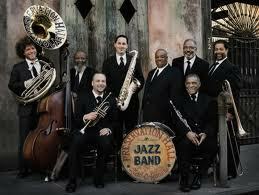 Preservation Hall has long served as a gathering place for visual and performing artists as well as a living homage to one of America’s most prized art forms. So it’s fitting that the Ogden Museum of Southern Art’s new exhibition honoring the venue traces not just half a century of New Orleans jazz, but also the community that supported it. “Art and Jazz: Preservation Hall at 50,” which runs through mid-July, features photographs, instruments, concert posters, recordings and other artifacts that highlight the lives and work of the people who made the Hall what it is today. The exhibit focuses special attention on Allan and Sandra Jaffe, who breathed new life into what had been a gallery that hosted jazz concerts, when they opened 726 St. Peter St. as Preservation Hall June 11, 1961. Indeed, the Hall became a place where music and art flourished, and where lasting relationships formed between artists – and between generations. A photograph by Lee Friedlander illustrates the same concept: In the picture, Allan Jaffe holds in his lap a toddler (Ben Jaffe) whose eyes are fixed wide on legendary musician and artist, Sister Gertrude Morgan. Morgan, who sold her art out of the building before it became Preservation Hall and continued to work there after 1961 as an artist and musician, smiles back at Ben, while clasping a tambourine. Morgan’s guitar and a selection of her artwork also adorn the walls. As part of the anniversary celebration, the museum also carries “Preservation Hall,” Sharon Brinkman and Eve Abrams’ new book of photographs and interviews documenting the venue’s rich history.